1960 - The newly built Kelmscott Branch Library was opened next to Kelmscott Station. 1961 - The A-K Roads Board becomes the Shire of Armadale-Kelmscott in 1961 (WA Local Govt Act passes). 1961 - St John's Ambulance Association Hall (Armadale sub-centre building) is opened. 1963 - A new St Mary's in the Valley church is built and opened. 1964 - Railway line from Armadale / Jandakot to Fremantle is closed. 1964 - Opening of Armadale Kelmscott Memorial Hospital, Albany Highway. 1966 - The Co-op is closed; Armadale Kelmscott Co-operative Society shop on Jull St shuts down. 1967 - A new Armadale Kelmscott Council Chambers and Administrative Offices building opened, facing Jull Street (superseded by new building on Orchard Avenue in 1985). 1967 - A new Free Reformed Church building opened on Fifth Road, Armadale. 1967 - Orlando Street Bridge declared unsafe. 1967 - The new Kelmscott Hall is opened; although the new building retained some of the original structure. 1968 - Frye Park in Kelmscott (Clifton Hills) opened for community recreation. 1969 - Kelmscott Village shopping centre opened, the district's first modern shopping complex. 1969 - Kingsley Primary School opened. 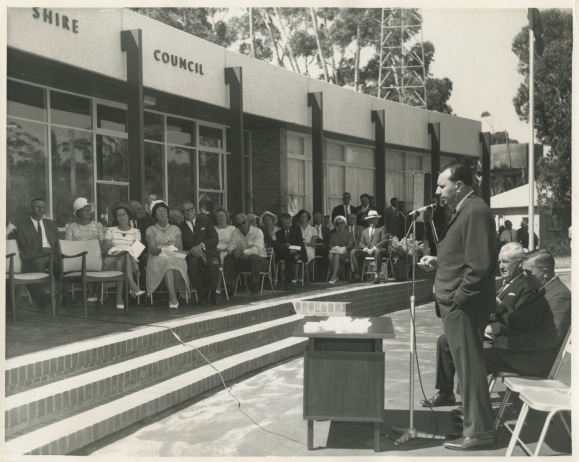 Opening of the new Armadale Kelmscott Shire offices and Council chambers in 1967.